I got to play a 1vs1 of the scenario and I realized I have to either change some wording or ban some abilities since I have 2 ships that may take a random treasure from any other wild island…ruining the fun and realism. Interesting, I haven’t found the Island treasure trading ability (what I call it) to be all that powerful or fun-ruining. Those are interesting ships there, mast saccing? During the recent podcast, Mike Selinker shared with me the patent for the Chop Shop Challenge game he mentioned (which I can’t find online so far). It says “Application status is Abandoned”. The only real bonus for them is that they can dock ships at it and transfer as much gold to it as they want, but it is very risky for them to do. Nice to see that the bored looking dude has made a comeback to something more interesting. Hmmm. Okay. How about dependent on a die roll and for one tun only, or would that not really fix the problem? I just think a ship that can teleport is dumb and I can’t endorse it in any way regardless of the circumstances. @Ed: Interesting set of ideas there. Have you played that scenario yet? About how broken would a ship with a base move of D be? Not a good idea, especially since it’s really dumb thematically. That would fall under the “just don’t” category, like L-cancellers for example. Had some decent pulls for those next two boxes, but on the last box with Seattle in it I pulled the 3 SR cards like woot and stuff, although why would a generic captain card be a super rare? That is quite lame. JH seems like a good gold runner/gatherer. I really like the Cove, nifty ability and nice flavor text too. Thanks! With her decent size cost I think of the JH as a kind of defensive or “escape” hybrid. That would be nearly perfect, but equipment are ussualy discarded when used maybe a unique treasure would be good. I would also accept an equipment that isn’t removed when used. The LE equipment are eliminated after use, but they’re extremely rare and not as good as the regular versions so I don’t see that being an issue. IMO the only way to do this would be to get an agreement/contract with NECA ahead of time to purchase the rights. Only then would you start a KS to raise the funds. If you just randomly started a KS to purchase something you have no idea if they even want to sell, I can’t imagine anyone backing it. @Scott: Haha yes I listened to it on multiple drives in the car. Thanks for commenting! I used old gift cards so millimeters thick and I used old business cards for the cardstock it was even thinner. The holes I sliced by razor so it was a really snug fit but if I messed up it was loose. Ability: Schooner. This ship gets +1 to her cannon rolls against English ships. If this ship is within S of an enemy ship when this ship is given a move action, she gets +S to her base move. I have used cardstock, plastic and cardboard all successfully but I like plastic and cardstock the most. 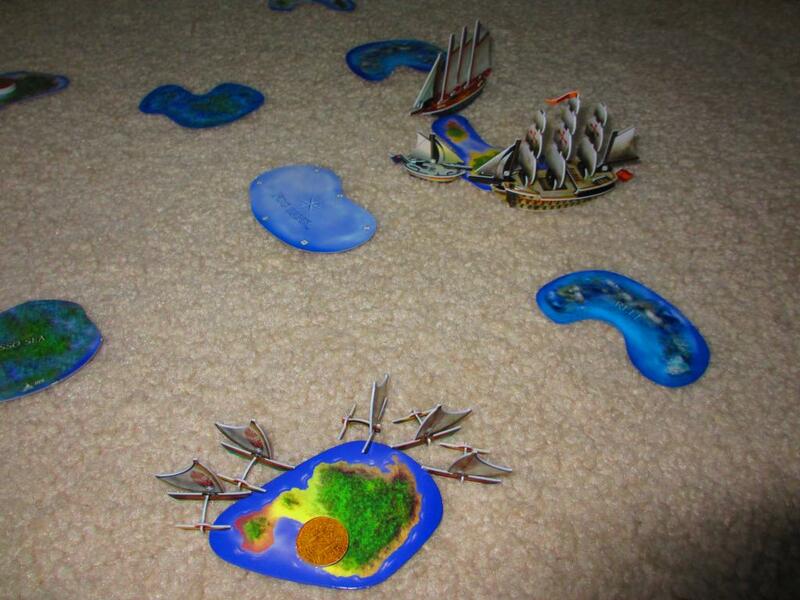 the 5 mast ship in my profile image is cardstock.